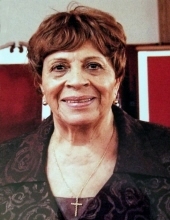 Mrs. Carolyn E. Liggon, 84, formerly of Danville, VA, entered eternal rest on Saturday, February 2, 2019 in Snellville, GA.
Mrs. Liggon was born in Danville, VA on December 10, 1934 to the late Margaret and Edward White. At an early age, she relocated to New York, graduating from Andrew S. Draper School in 1951. She was a member of Gethsemane Baptist Church, St. Paul Baptist Church, and Morning Star Full Gospel Assembly where she served as a Deaconess. Mrs. Liggon worked at the New York Telephone Company for several years, and later retired from Blue Cross / Blue Shield of New York after seventeen years of service. Mrs. Liggon was previously married to the late Charles F. Vines in 1955, and through that union Charlene and Reggie “Kenny” were born. She later married Gus Liggon, Jr. in 1996. She leaves to cherish her memories her husband, Gus Liggon, Jr.; daughter, Charlene Marilla (Minnard) ; son, Reggie “Kenny” Vines; stepsons, Jimmy Liggon (India) and Stephen Liggon (Carolyn); stepdaughter, Amy Dailey (Wade); eight grandchildren, seven great-grandchildren; sister, Theresa Angevin (Ange), and a vast number of other loving relatives and caring friends. Funeral services for Mrs. Carolyn E. Liggon will be conducted 2:00 P.M. Saturday, February 9, 2019 at Silone Baptist Church, Chase City, VA with Rev. Dr. Garland B. Liggon, Sr. officiating. Burial will follow in Thyne Memorial Presbyterian Church Cemetery, Chase City, VA. Public viewing for family and friends will be held on Friday from 10:00 A.M. until 6:00 P.M.
To plant a tree in memory of Carolyn Elizabeth Liggon, please visit our Tribute Store. "Email Address" would like to share the life celebration of Carolyn Elizabeth Liggon. Click on the "link" to go to share a favorite memory or leave a condolence message for the family.